The following is a summary of the rules for each quarantine. Contact us with questions about the quarantines and requests for compliance agreements. Contact the Horticulture Program in the Maine Department of Agriculture, Conservation and Forestry, Animal and Plant Health Division for information about regulations on plant material other than forest products (such as wreaths, nursery stock, Christmas trees and seeds). Federal quarantine laws, such as those prohibiting movement of material from Asian longhorned beetle and emerald ash borer quarantine areas regulate movement across state lines. These are administered by the United States Department of Agriculture, Animal and Plant Health Inspection Service, Plant Protection and Quarantine (USDA APHIS PPQ). Forestry quarantines in Canada are overseen by the Canadian Food Inspection Agency (CFIA). 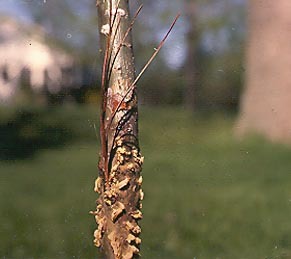 The European Larch Canker Federal Quarantine is listed under 7 CFR Part 301.91, United States Department of Agriculture, Animal & Plant Health Inspection Service, Plant Protection and Quarantine as printed in the Federal Register (Rule can be found here, under "Text of Federal Regulatory Rule". The State European Larch Canker Quarantine is authorized under 7 MRSA, Chapter 409, Section 2301-2303 of the Laws of the State of Maine. The rule as it relates to forest products is summarized below (complete text (PDF | 66 KB)). This quarantines all parts of larch (Larix spp.) including logs, pulpwood, branches, twigs, etc., as regulated articles. Also any other product, article, or means of conveyance whatsoever, when it has been determined by an inspector that it presents a risk of spread of the disease. Designates parts of Hancock, Knox, Lincoln, Waldo, and Washington Counties as the quarantined area from which movement is restricted (map (PDF | 887 KB), European Larch Canker Quarantine Area in Maine--2010 List of Towns and Counties). This quarantine is managed by the USDA-APHIS, PPQ in Hermon, Maine, phone: (207) 848-0001, and the Forest Health & Monitoring Division of the Maine Forest Service, phone: (207) 287-2431 or 287-2791. The Maine Department of Agriculture, Conservation and Forestry is proposing an expansion of the gypsy moth quarantine found in CMR 01-001, Chapter 271. This proposed rule establishes a state quarantine against the gypsy moth to prevent its movement from all counties except parts of Aroostook, Piscataquis and Somerset Counties to other parts of the State. This quarantine is necessary to protect Maine's and other state’s forest and landscape tree resources. The Gypsy moth is federally regulated and this rule fulfills the requirement that Maine must have a similar state quarantine in place because the state is partially regulated for gypsy moth. The public hearing is scheduled for February 11, 2019, 6:30 PM at the Maine Forest Service Office, 45 Radar Road, Ashland, Maine 04732-0972. If you cannot attend the hearing, written comments will be accepted until midnight February 25, 2019. Please send comments to me at the address, email or fax listed below. The Gypsy Moth Federal Quarantine is listed under 7 CFR Part 301.45, United States Department of Agriculture, Animal & Plant Health Inspection Service, Plant Protection and Quarantine as printed in the Federal Register Rule, under "Federal Regulation"). The Gypsy Moth Quarantine is authorized under 7 MRSA, Chapter 409, Section 2301-2303of the Laws of the State of Maine. The rule as it relates to forest products is summarized below (complete text (PDF | 68 KB)). This quarantine designates the infested area in Maine as quarantined for the movement of regulated articles, which includes wood such as logs, pulpwood, trees, shrubs, firewood, Christmas trees, and chips, and requires the inspection and certification of such material if movement is to non-infested states and foreign countries. This is administered by the USDA-APHIS, PPQ in Hermon, Maine, phone: (207) 848-5199. Inasmuch as Maine is not completely infested and quarantined, wood or regulated articles moving from the infested area of the state to the non-infested area must be accompanied by a certificate or go to a mill under state compliance agreement which allows the reception of such articles. Regulated articles moving from the non-infested area of the state to other non-infested states or non-infested parts of Canada must be accompanied by a state permit stating that the regulated article originated outside of the infested area of the state. This quarantine is managed by the Forest Health & Monitoring Division of the Maine Forest Service, phone: (207) 287-2431 or 287-2791. The Hemlock Woolly Adelgid Quarantine is authorized under 7 MRSA, Chapter 409,sec. 2301-2303 of the Laws of the State of Maine. The rule as it relates to forest products is summarized below (complete text (Word | 44 KB)). This chapter establishes a quarantine against the Hemlock Woolly Adelgid to prevent its artificial spread in the State, in order to protect Maine's forest, timber and wildlife resources from this destructive pest. A quarantine is established against the following pest and possible carriers. A. Pest. Hemlock Woolly Adelgid (Adelges tsugae Annand). In the eastern United States, the counties included in the USDA Forest Service's publication entitled "List of Counties and States with Known Hemlock Woolly Adelgid Infestations". In the western United States and Canada, the states of Alaska, California, Oregon and Washington and the province of British Columbia. C. Regulated articles. Rooted hemlock plants, hemlock branches and/or needles, hemlock chips with top material (branches and/or needles), uncomposted bark with top material (branches and/or needles). D. Restrictions. All regulated articles having originated or previously been held in an area under quarantine are prohibited entry into non-quarantined areas in the State of Maine except as specifically allowed in the rules. 1. Any written agreement to ship hemlock logs, lumber with bark, chips with bark, and uncomposted bark from quarantined and non-quarantined areas to preapproved sites in Maine may be canceled by the Maine Forest Service if the person who entered into it fails to comply with the provisions of this rule. If the person has been given notice of cancellation orally, written confirmation of the decision and the reasons for it will be provided within 10 working days. Written agreements may be reinstated by the Maine Forest Service if it finds that the reason(s) for cancellation has (have) been rectified. 2. Any person found to violate any provision of this quarantine is guilty of a Class E crime. The Pine Shoot Beetle Federal Quarantine is listed under 7 CFR Part 301.5, United States Department of Agriculture, Animal & Plant Health Inspection Service, Plant Protection and Quarantine as printed in the Federal Register (Rule can be found here, under "Federal Regulation"). The Pine Shoot Beetle State Quarantine is authorized under 7 MRSA, Chapter 409, Section 2301-2303of the Laws of the State of MaineThe rule as it relates to forest products is summarized below (complete text (MS Word | 37 KB)). Designates infested and regulated areas in the United States of America including the following areas in Maine: all counties except Aroostook and Washington counties. Requires concerns outside the regulated area receiving pine products with bark from within the regulated area to have written compliance agreements. Regulations restricting movement of regulated pine products with bark are complex and vary depending on the kind of product and the season of the year. Concerns and individuals engaged in receiving pine with bark or pine bark products should refer to the detailed regulations or call (207) 287-2431 for assistance. The White Pine Blister Rust Regulations and Quarantine are listed under Title 12 MRSA 1988, Subchapter III, ¤803:8305 Shipment Prohibited. The director may prohibit, prevent or regulate the entry into or movement within the State, from any part thereof to any other part, of any plants of the genus Ribes or other nursery or wildling plants, stock or parts of plants which may cause the introduction or spread of a dangerous forest insect or disease. The director may issue the necessary orders, permits and notices necessary to carry out this section which shall not be considered to require or constitute an adjudicatory proceeding under the Maine Administrative Procedure Act, Title 5, Chapter 375. The sale, transportation, further planting or possession of plants of the genus Ribes (commonly) known as currant and gooseberry plants, including cultivated, wild, or ornamental sorts is prohibited in the following Counties in the State of Maine, to wit: York, Cumberland, Androscoggin, Kennebec, Sagadahoc, Lincoln, Knox, Waldo, Hancock, and parts of Oxford, Franklin, Somerset, Piscataquis, Penobscot, Aroostook, and Washington (map (PDF | 1.4 MB), list of towns (PDF | 547 KB)). The planting or possession of European Black Currant, Ribes nigrum, or its varieties or hybrids anywhere within the boundaries of the State of Maine is prohibited. This quarantine is administered by the Maine Forest Service, Forest Health and Monitoring, phone: (207) 287-2431 or 287-2791.